In this 5-minute video, Dr. Christos Kolias, Senior Research Scientist at Orange Silicon Valley and one of the founding members of the NFV initiative within ETSI, introduces the basic concepts and objectives of network functions virtualisation. An ETSI meeting is underway this week in Bonn, Germany to further advance the initiative. NFV, in a nutshell, is about implementing and running network functions and services purely in software, on commoditized servers. The NFV vision is summarized as being able to operate in an environment where most if not of all of telecom boxes have given way to software-based solutions. Back in fall of 2012, a number of operators got together and decided to form an industry specifications group under the European telecommunications Standards Institute (ETSI) in order to pursue the development of NFV. The clear objective and mandate of the group is to produce a set of requirements (as laid by the operators) and an overall specifications framework that could lead to further standardization efforts - but the latter is a sought goal of this group. Other goals include the exposure of use cases and the in-lab development of Proofs-of-concepts. 00:12 - What is NFV? 01:41 - What is the vision of NFV? 02:29 - Is NFV the same as SDN? How does NFV bring an Open Paradigm to Networking? 03:48 - Who is developing NFV? Will it be standardized? 04:32 - What are some basic NFV concepts? 05:04 - How can I learn more about NFV? The Optical Internetworking Forum approved three security implementation agreements (IAs) and elected several new directors and committee chairs. Network elements have OAM&P interfaces used for network management, billing andaccounting, configuration, error logging, maintenance and other administrative activities unprotected. This IA defines improved mechanisms for securing and protecting OAM&P interfaces to a network element. This IA defines and updates common Security Extensions for securing the protocols used in the OIF’s UNI and E-NNI which calls for a complete, unified and simplified approach to security. This IA addresses updates for controlling and securing the generation, transport and storage of log data to enable an auditing capability for the OIF’s UNI and E-NNI. Newly elected to the board of directors are John McDonough of NEC, who will serve a one-year term as vice president of marketing, and David Stauffer of IBM and Hans-Martin Foisel of Deutsche Telekom who will each serve a two-year term as a board member. Also newly elected is Joe Whitehouse of Metaswitch Networks, who will serve a one-year term as the Market Awareness& Education co-chair, Networking. Ghani Abbas of Ericsson, who will serve a two-year term, was appointed Secretary/Treasurer, and Vishnu Shukla of Verizon, who will extend his term as vice president for one-year. Torsten Wuth of Nokia Siemens Networks as the Physical Layer User Group chair. IEEE, Internet Architecture Board (IAB), Internet Engineering Task Force (IETF), Internet Society and World Wide Web Consortium (W3C) reached agreement for establishing a modern paradigm for global, open standards. The agreement is premised on the understanding that the economics of global markets - fueled by technological innovation - drive global deployment of standards, regardless of their formal status within traditional bodies of national representation. 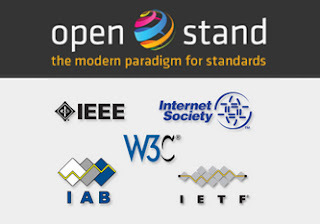 Standards developed and adopted via the OpenStand principles include IEEE standards for the Internet’s physical connectivity, IETF standards for end-to-end global Internet interoperability and the W3C standards for the World Wide Web. A new Cloud Advisory Council has been established to support the roll-out of next-generation cloud architecture. The Cloud Advisory Council brings together original equipment manufacturers (OEMs), strategic technology suppliers, independent software vendors (ISVs), and end-users. Founding members include: AMAX, AMD, Atlantic.Net, Check Point Software, Colfax, DDN, Eucalyptus, Mellanox Technologies, Nanjing Standard Communication, Nimbula, ProfitBricks, SGI, Sugon, Supermicro, and Xeround. The MPEG Industry Forum declared victory and is now winding down its work. By the end of this month, all remaining assets will be put into the hands of the Open IPTV Forum. The MPEG Industry Forum was initiated in June 2000 with mission to educate and evangelize an emerging standards based solution that became known as MPEG-4 Part 10, aka AVC, aka H.264. At the time, there was considerable industry fragmentation as to the future of video compression. Slowly but surely H.264 gained mind share and then market share and today is clearly the dominant codec of choice replacing MPEG-2 around the world. Hence, the MPEG Forum has declared victory. The TM Forum and the Open Data Center Alliance (ODCA) are working together to develop standards for enterprise cloud services. The ODCA and the ECLC plan to work on two projects per year with the ODCA leading the definition of enterprise requirements, and the ECLC conducting proof of concept projects to evaluate how new requirements address enterprise needs. Their initial projects will define specific aspects of virtual private cloud, including the computing aspects of Infrastructure-as-a-Service such as the creation of standards-based service catalogs and standard units of measure--or ways to quantify or describe different cloud services such as speed, storage capacity, security and bandwidth. CableLabs has introduced an equipment qualification program for its DOCSIS Provisioning of EPON (DPoE) project, with an aim to facilitate accelerated development of devices that support the delivery of business communications services using Ethernet Passive Optical Network. CableLabs said its DPoE Qualification Program allows equipment makers to certify that their technology and devices are compliant with CableLabs DPoE version 1.0 specifications, which describe a common approach for using DOCSIS back-office provisioning processes to deliver business data services over EPON access networks. The DPoE specifications were published in February 2011. "Having devices qualified by CableLabs promises to encourage widespread deployment of this new technology and lower costs to both cable operators and business customers by leveraging the proven provisioning capabilities of DOCSIS," said Nomi Bergman, President of Bright House Networks. ETSI, the European standards organization, published two specifications aimed at accelerating the deployment of Smart Grid technologies. Group specification GS OSG 001: Open Smart Grid Protocol. Produced by the ETSI Open Smart Grid Industry Specification Group, this application layer protocol can be used with multiple communication media. Technical specification TS 103 908: Powerline Telecommunications (PLT); BPSK Narrow Band Power Line Channel for Smart Metering Applications. This specification defines a high-performance narrow band powerline channel for control networking in the smart grid that can be used with multiple smart grid devices. It was produced by the ETSI Technical Committee for Powerline Telecommunications (TC PLT). The IEEE Standards Association (IEEE-SA) Standards Board has approved work to begin on IEEE P1907.1 – Standard for Network-Adaptive Quality of Experience (QoE) Management Scheme for Real-Time Mobile Video Communications. The proposed standard would address the quality of mobile video communications. It would help network operators, application developers, service/content providers and end users to develop, deploy and utilize real-time collaborative services. “The goal of IEEE P1907.1 is to help raise the bar for real-time mobile video communications, ultimately resulting in a richer and more satisfying end-user experience,�? said John Ralston, chair of the IEEE P1907.1 Working Group. “By tackling real-time video capture, transmission and monitoring of received video quality, IEEE P1907.1 is intended to facilitate a high-quality real-time mobile video user experience within the constraints of mobile devices and networks." IEEE will form a new Power Matters Alliance (PMA) dedicated to remaking consumers’ daily interaction with power as wireless, environmentally sound, and smart. The PMA will develop the suite of "Power 2.0" standards covering the entire consumer power ecosystem, such as mobile, computing, in-car, consumer electronics, smart batteries, household power, and power-in-public-places. Additionally, Power 2.0 will enable interaction of software and services with power. “IEEE has been a leader in the advancement of power since its earliest days, when electricity was just beginning to become a major force in society, to today where we have more than 100 active standards or standards in development specifically related to power,�? said Judith Gorman, managing director, IEEE Standards Association. A new Japan Mobile NFC Consortium has been established by NTT DOCOMO, KDDI and SOFTBANK MOBILE to coordinate the adoption of multiple international standards for near field communication (NFC) technologies incorporated in their mobile devices and services. Japan’s three mobile operators already offer Osaifu- Keitai™(wallet phone) mobile services based on the contactless-IC smartcard called FeliCa. Overseas, however, mobile operators and service providers are increasingly adopting Type A and Type B standards to develop growing markets for NFC services. In view of this worldwide trend, the consortium intends to work with mobile industry groups in Japan, including service suppliers and handset manufacturers, to incorporate compatibility with the Type A and B standards in the Japanese mobile ecosystem. The Telecommunications Industry Association's (TIA) released a specification defining a Smart Device Communications Reference Architecture for machine-to-machine (M2M) applications. The TIA-4940 Smart Device Communications Reference Architecture standard addresses common requirements and interoperability of essential intelligent/smart devices across industries. It will work across both wired and wireless transport layers and take advantage of IP-enabled applications covering different types of vertical markets. "We are very pleased that the committee developed this M2M Standard quickly with effective collaboration with other international Standards Development Organizations (SDOs) throughout the process," said Cheryl Blum, TIA Vice-President for Technology and Standards. The Broadband Forum published its new "Technical Specification for MPLS in Mobile Backhaul Networks" (TR-221), which is set to become a key enabler for mobile operators as they migrate from traditional TDM networks to packet-based transport technologies and from 2G/3G to 4G and LTE services. TR-221 provides a key resource to the industry as it gears up for explosive growth in IP traffic driven by new and enhanced devices on the mobile market, from tablets and smartphones to multifunction gaming consoles. TR-221 focuses on the applications of MPLS technology in a range of services that may be used to transport wireless traffic in the access and aggregation networks, including IP, TDM, ATM and Ethernet. It defines the global requirements of MPLS technology in these networks in respect of encapsulation, signalling and routing, QoS, OAM, resiliency, security and synchronization. It also covers expected services over the backhaul network that include voice, multimedia services, data traffic, and multicast traffic such as multimedia broadcast and multicast services (MBMS). Adherence to these requirements will create global standards for MPLS oriented equipment, establishing more network interoperability, speeding deployments and lowering the overall costs of the backhaul network. Defining a range of reference architectures for MPLS based Mobile Backhaul networks; TR-221 includes specifications for the various transport scenarios applicable to all mobile networks (e.g. 2G, 3G and LTE). It also specifies the equipment requirements for the control, user and management planes to provide unified and consistent end-to-end transport services for mobile backhaul. The IEEE has launched a study group to investigate a new PHY (Physical Layer) standard for operating the Ethernet Passive Optical Network (EPON) protocol transparently over coaxial distribution networks. The goal would be to use IEEE 802.3 Ethernet specifications to significantly boost and broaden the capabilities of Ethernet in existing access networks. IEEE 802.3 EPON specifications include symmetric data rates of 1 Gbps and 10 Gbps, as well as asymmetric data rates of 10 Gbps downstream and 1 Gbps upstream. “Operating EPON transparently over coax is a significant step forward. It will help to transform the industry by greatly simplifying operator networks while simultaneously offering subscribers easy and efficient access to dramatically increased bandwidth,�? said Howard Frazier, chair, IEEE 802.3 EPoC Study Group and senior technical director, Broadcom Corporation. “The ability to leverage existing Ethernet infrastructures and cable plant investments while offering a ten-fold increase in data speeds is revolutionary.�?